There’s been another blogging lull, and a bit of a sewing lull, but I had a ridiculously productive sewing weekend at an amazing retreat center at Stitch Supply Co in Altoona, Wisconsin and I was able to get so much accomplished. The first thing I did on Thursday was a quilt top for my first nephew that has graduated high school and is off to college. I bought all of the fabric @ SSC the first week of June and had almost all of it cut, but just hadn’t had a chance to make much headway. Thursday evening I was able to completely finish the top, a very simple half square triangle quilt with huge blocks (efficiency, yo!). I didn’t get a photo of the finished top because there wasn’t an open design board that was easily accessible, so here’s an in-progress shot. Not fantastic light, but you get the idea. It’s much larger than he’ll need on his dorm room bed, but bigger is better when it comes to quilts! Friday I was FINALLY able to get my do. 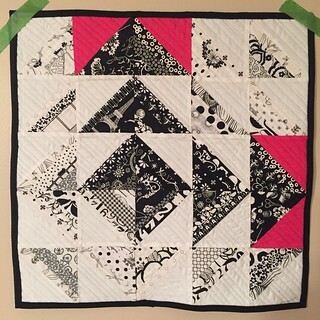 Good Stitches quilt put together that I collected blocks for back in June/July 2015! [Insert embarrassed face here.] 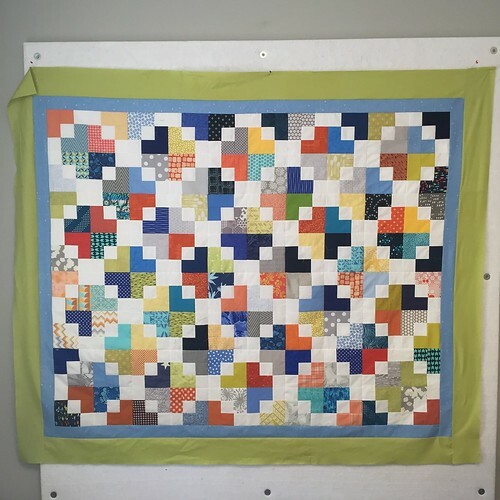 I was leery of being the host for exactly this reason – I knew it would take me quite a while to get the top together, and now I need to send it off to be quilted because I don’t quilt my own. The pattern is Swell by Camille Roskelley. I just love how the top turned out! Later in the day on Friday I did a little shopping because I REALLY had to have one (ok, two) of the bundles that Ann had in the shop. 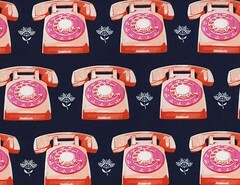 The top fabric on the bundle was Melody Miller’s Trinket Telephones and even though orange/pink/blue is not a pallet I would have thought I’d use, I just loved it. I loved it so much that I cut into it before I even took a picture of it! GASP! 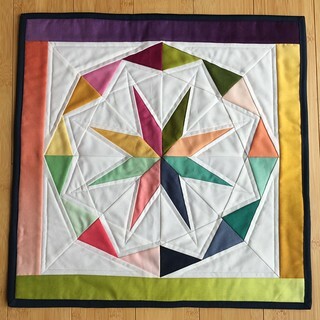 I knew immediately I wanted to do a plus quilt. I wish I had a better photo, but it was 2:30 am when I put in the final stitches, then hung it up so I could grab this photo. 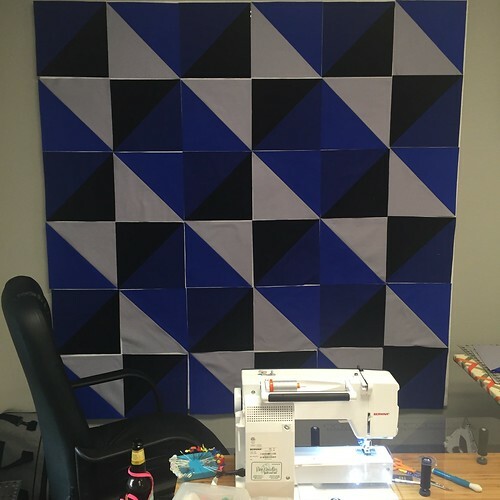 I cut the whole thing on Friday evening and put the entire layout up on the design wall before I went to bed (well, except for the two rows I added after I had all of the other rows together – it just wasn’t long enough yet, and I had extra fabric available). I started sewing around 9am on Saturday and just kept sewing. 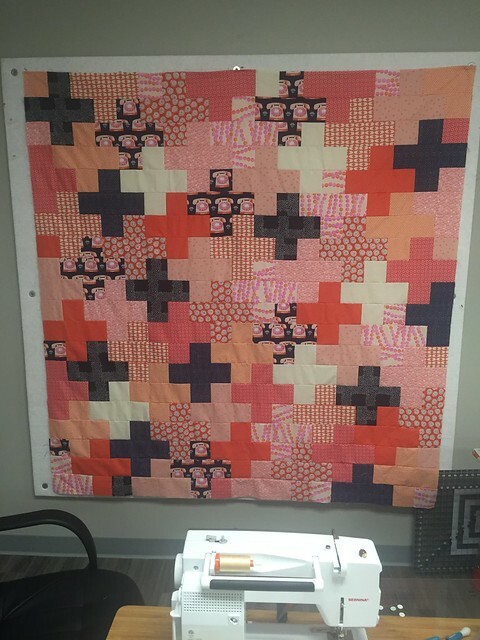 That design board was roughly 72×72, so that gives you an idea of the size of the quilt. I’m going to use an orange minky on the back. It’s gonna be great, and it’s gonna be mine! Now to figure out how to quilt it. I’m thinking something with circles or swirls but I haven’t decided yet. Sunday morning I pieced a back for a baby quilt, then I made bindings for the baby quilt and the senior quilt. 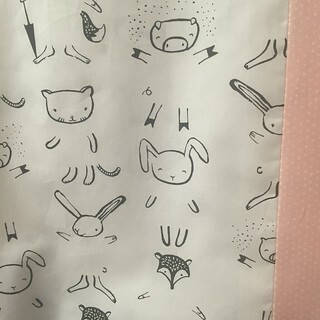 Just a little peek at the back for the baby quilt. White for a back? Sure, why not? Use it, wash it, repeat. I finished the mini for the ombre swap and I’m very happy with how it turned out! 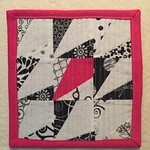 I also sent her a mini mini made up of little blocks that were my Plan A for this swap project. Once they were assembled into a respectable mini size, they were simply too busy and I needed a Plan B. I’m quite happy with how Plan B turned out (above), but I also had a bunch of little squares left over that I didn’t want to waste, so I made her a mini mini 2 days before I sent out her package. I also made a mini mini (smaller than the one above) that I sent to Yvonne (QuiltingJetGirl) because she loves minis, and mini minis! 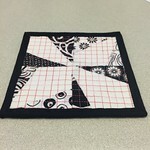 Although there hasn’t been much blogging going on, there has been a good amount of sewing going on. 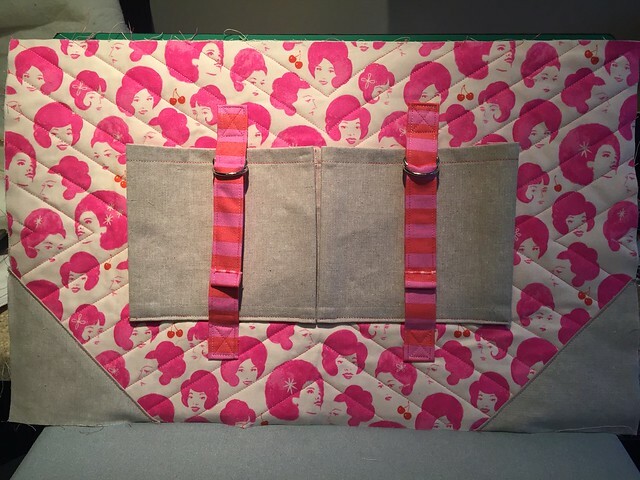 This entry was posted in Crafts, Quilts, Uncategorized and tagged betsy bag, black and white mini swap, camille Roskelley, cotton and steel, melody miller, Plus Quilt, senior quilt, stich supply retreat, Stitch Supply Co, swell, wee gallery. Bookmark the permalink.